Did you know that periodontal (gum) disease will affect 75% of adults sometime in their lifetime? 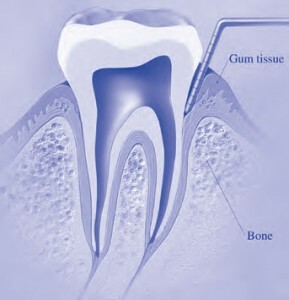 Periodontal disease is an infection of the gums and, if left untreated, will gradually destroy the bone that supports your teeth, and cause eventual tooth loss. Therefore, in addition to taking care of your teeth, it is vital to ensure the health of your gums and your teeth’s supporting structures. If your gums are tender or swollen, or you frequently experience bleeding after flossing or brushing your teeth, you are seeing the first signs of what can turn into major periodontal disease. After a diagnosis is made, the infection needs to be eliminated and risk factors addressed, such as oral hygiene, medical health issues and even diet. 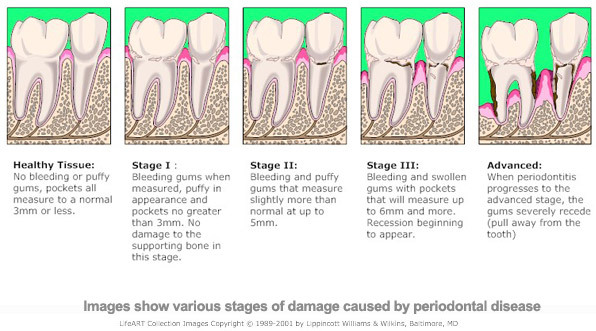 If your periodontal problems are in their early stages, we will design a plan to eliminate the disease. If the periodontal concerns are severe, however, we will refer you to a gum specialist, called a periodontist, who will become part of the team to get your mouth to optimal health. Once we have restored you to a state of good periodontal health, we will work with you to help keep your gums, teeth and the bone that supports your teeth healthy. This effort requires regular daily brushing and flossing to remove future build up of bacterial plaque. Regular maintenance teeth cleanings at our office will help us to monitor your periodontal health and give you the latest techniques and treatments for controlling your disease. Dr. Gottlieb and our highly trained dental hygienist staff will recommend how often you should schedule your cleanings and exams in order to maintain optimal periodontal health.